1 We're all French now? Lovely. So our old people can die in nursing homes with no a/c while the staff is all on holiday. On the plus side, that will help with the growing medicaid bills for everyone too old to care for themselves. 2 Just to run the numbers from the first bailout: http://justwanderingthrough.blogspot.com/2009/02/we-get-government-we-deserve.html I'm afraid to see what they were for the up-for-election Representatives and for this current "stimulus". But in the end, I bet we're getting what we deserve. Sadly. 3 Oh, I've never seen such a good time to become personally skilled in the cultivation and use of medicinal plants. Also to get some skills beyond first aid. Especially with this article I saw on Drudge about part of what's in this "stimulus" bill:One new bureaucracy, the National Coordinator of Health Information Technology, will monitor treatments to make sure your doctor is doing what the federal government deems appropriate and cost effective. The goal is to reduce costs and guide your doctors decisions (442, 446). (emphasis mine, of course)ACK. What happens when the euthanasia movement gains more traction??? 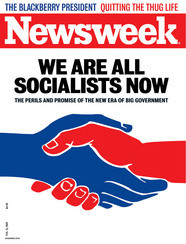 And I feel the need to blog about it, but I'll just state it quickly here: "We" are NOT all social-ists. 4 When the revolution comes it's not going to be pretty. 5 Nor will it be televised. 6 By Barack, at last, my dream is coming true ... We are all ikwO now. Can't help but do a victory dance at the grave of capitalism. The words just roll off my tOngue: Sarah ... soci@list! airforcewife ... soci@list! kannie ... soci@list! Mare ... soci@list! So how does it feel to be my cOmrades? Let's make revOlutiOn together! Why can't we be friends? All is fOrgiven if you say the soci@list shahada: "There is no one but the One." 8 I hope we will still recognize America by the time we get a chance to vote Obama out of office, and maybe the American public will have a serious case of "buyer's remorse" for giving control of both houses of Congress to the Dems when the 2010 mid-terms roll around. One can only hope. My fear is the damage done before then (especially with all those little things tucked away inside this "emergency" "stimulus" package that they are all in too much of a hurry to pretend to notice, or for US to get wind of it). 1 You are anything but nuts. That's why I was looking forward to what you had to say about Suleman. But yeah, Julie - and her readers - already said it all. Thanks for the links! I've never been turned off by the idea of multiple births. It's the context of this particular instance that disturbs me. She's sui generis, and in a pretty bad way. I don't want anyone to think you are anything like her. Crossing my fingers for multiples. The world needs more people like you. 2 BTDT. Two years and all this stuff does a LOT to a person. And I, too, became comfortable with multiples. In fact, after my first, even remotely successful cycle on fertility drugs, my dr. flat out cancelled due to 5 mature follicles with the statement, I don't do litters. We can not and will not let this happen. At the time, that made me insane, I mean really this was the only positive progress I'd had in years. In retrospect, this is why people are so heavily monitored. It's a PITA, but really, somewhat necessary. And AMEN, thanks for all the ruining all the progress made in public perception of fertility treatments. 3 Hi, I'm Susie. I'm a French student in Pitzer and I have to write about a true event that happened in my college like Capote did in In Cold Blood. (it's for a writing class) I've chosen the case of Kerry Dunn and I've seen you posted messages about her. Did you know her before? Did you attend some of her classes? Can you speak a bit about you as a student in the College when it happened? Thanks in advance for your answers. 4 Sarah - Thinking of you. As a side note, one of my best friends has a really interesting birth story - in fact, it was just published in a book. It was an interesting read for me, who was there for her thru it all, however to read it thru her eyes. 106kb generated in CPU 0.13, elapsed 0.3348 seconds. 57 queries taking 0.2399 seconds, 247 records returned.